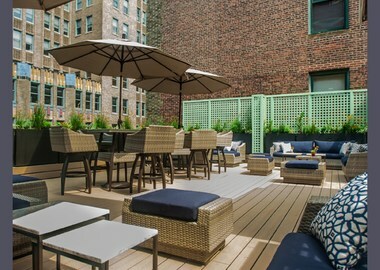 - Luxurious boutique hotel located in Midtown. - Concierge services provided to make your stay exceptional. They will be happy to valet your car, press your laundry, provide dog-walking services, and will assist you with dinner reservations and theater tickets. - A recent renovation updated the entire hotel including eco-friendly instillation's. - HGU New York has been featured in countless magazines including Forbes, The New York Post, and Conde Nast Traveler! The striking Beaux-Arts structure that is HGU New York has welcomed countless guests since 1905. Ornate plaster ceilings tell of legendary parties and infamous patrons of old, while 90 rooms and suites offer luxury and modern convenience. Restful sleep is paired perfectly with an intoxicating art collection throughout the rooms, corridors, and living spaces; each corner a destination of possible repose or reverie. Derived from the style coveted by the leisure and business set, HGU New York awakens all senses and consistently impresses.